The new full-color Rough Guide to Central America on a Budget is the ultimate guide to traveling the region and getting the most value for every dollar, colón, quetzal, or lempira. Detailed color maps and in-depth coverage of how to get around go hand-in-hand with inspirational itineraries and authoritative accounts of every attraction. 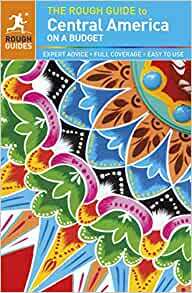 This guidebook covers all the Central American countries and features first-hand reviews of affordable accommodation, cheap places to eat, laid-back bars, and thrilling outdoor adventures. The Rough Guide to Central America on a Budget is packed with epic road trips, adventure activities, ancient ruins, beach hideaways, wildlife watching, atmospheric colonial cities, and all the best festivals. Make the most of your time with The Rough Guide to Central America on a Budget. This book ended up being just what I needed. I did a 6 month backpacking trip through Central America, so carrying as little weight as possible was really important. I wanted to get an "overall" region guide rather than guides for individual countries for this reason. I bought both the Lonely Planet Central America book as well as this one, and ended up like this one better. The tipping point for me was the layout (so take a look at both to see what you think): I liked that the beginning of each country included a brief history, a few country highlights, and that every separate area of a country was broken down to list accommodations (including hostels and cheap hotels which was perfect for me), restaurants and sights. While obviously you aren't going to get the same level of detail with a regional guidebook as you do with a country-specific guidebook, I was still impressed with what they were able to include. I would recommend it to anyone doing a trip through several Central American countries. I wanted a general outline of the area so I could decide which counties to visit.Costa Rica was high on my list but had heard that Nicaragua was almost as nice and considerably cheaper.I didn't want to buy individual books for each country as some I think I will be just passing through.washable to get a good idea of prices and things to see and do. While backpacking through Central America, it was agreed upon that this was the best book to use out of all the other books travelers brought. Only negative is that it doesn't include Southern Mexico. I really wanted to like this guide because I try to avoid touristy spots when I can and I'm trying to avoid the pitfall of the lonely planet circuit, but this guide simply was not as useful as we hoped because it lacked really basic information. For example how to call the united states from honduras or the fact that you need a honduran national id to purchase a sim card in honduras. The guatemala section was much better than the honduras one. However what information was included in a given town was so inconsistent that using the guide was an exercise in patience. There appears to be a lot of attention paid to cafes and nightlife so if these are important to you it might be a better guide than it was for us.